The Office of Controller of Examinations (OCE), Sanothimi, this morning published the results of Secondary Education Examinations (SEE) in letter grading system. 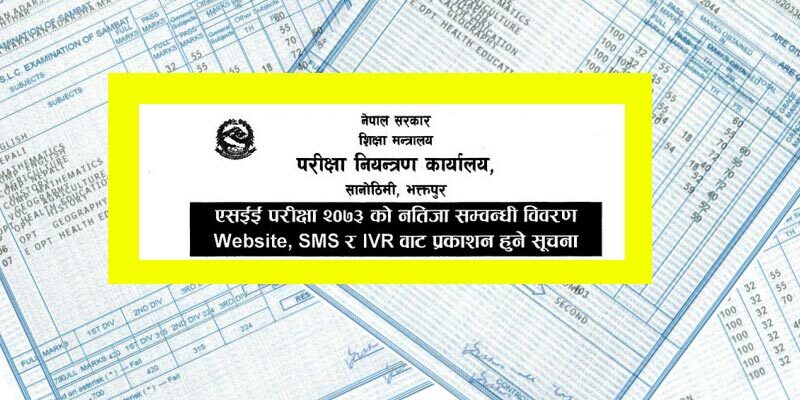 As per the results made public, 4,284 students have secured Grade Point Average (GPA) 3.65 to 4.o0 in regular category the Controller of Examinations Ambika Regmi informed to Rastriya Samachar Samiti. Similarly, 42,427 candidates have secured GPA ranging from 3.25 to 3.60; 50,646 in the range of 2.85 to 3.02; 61,955 in the range of 2.45 to 2.80; 91,314 in the range of 2.5 to 2.40 and 108,464 in 1.65 to 2.00. Likewise, 64,577 candidates have secured GPA ranging from 1.25 to 1.60 . A total of 483,967 candidates had filled for regular and exempted categories among which 463,166 appeared in the exam that commenced on March 16 and concluded on March 27 this year. The examinations took place from 8 am to 11 am.